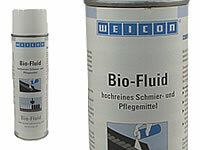 Bio-Fluid is a high purity mineral oil, developed especially for foods, cosmetics and pharmaceutical industry. It is neutral in taste and odor and is in accordance with the regulations of the "German Pharmacopoeia (Deutsche Arzneimittelbuch)". To clean and take care of stainless steel surfaces in canteens, butchers and backeries. Furthermore to lubricate packaging, filling stations and also machinery which is exposed to wear and tear and has contact with foods. 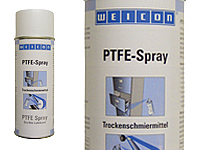 PTFE-Spray is a fat-free dry lubricant with concurrent anti stick effect based on PTFE (Polytetrafluorethylen). It adheress to all metal, plastic and wooden surfaces. The coat is repellent against dirt, dust, water and also resistant to oil, fat and many chemicals. At glide bars, channel, conveyor band, gears, chains, threads, locks, driving belts and hinges. 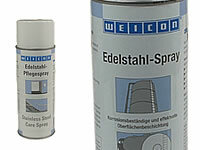 As permanent lubrication for shafts in plastics seats. 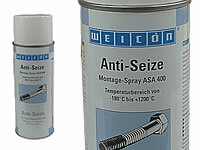 Anti-Seize is a reliable protection agent against corrosion, seizing and wear. It gets used during the installation of hose connections to make disassembly much easier. Silicon-Spray is an ideal slide and seperation agent. Concurrently it functions as protection and care agent for plastics, rubber and metal. It produces a long term formation of release agents and good surface properties. Prevents adhesion of goods to the conveyor belt, protects electric contacts against humidity, prevents the accumulation of glue remains at presses and steerings. 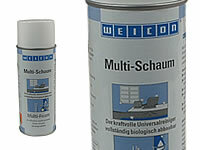 Multi foam is a universal applicable, strong foam cleaner. It is environmentally neutral, bio-degradeable, free of phosphate, formaldehyade and corrosive additions. Cleans glas, metal and plastic parts residue free. Furthermore it gently removes stains from carpets and cushions, solves dirt films off armatures and tiles.